Beauty and reverie...: My first haul post! Accessorize clearly weren’t ever content with me going into their shop and cooing over every shiny thing strewn in my path. Now it seems that they want me to go up to their makeup counter in Superdrug and do exactly the same. Naturally I obliged and came away recently with a pleasant surprise. For some reason, there are quite a few gift sets in Superdrug that have been reduced down considerably and are on displays right now. You can buy 2 sets of 3 Accessorize eyeshadows for £2 instead of the usual £4 each! They have a similar offer on some of the nail polishes in rather delightful shades too. Mike treated me to the set of eyeshadows in truffle, sage and baby pink, but I didn’t feel quite as naughty knowing they were such a bargain! The other boxed set shown contained a ‘Black ink’ GOSH eyeliner pencil that normally retails at about £5, a GOSH quattro eyeshadow compact in ‘Evergreen’ that normally would be about £8 and a peachy lipgloss tube. Although on further inspection I wasn’t too impressed by the lipgloss, I don’t really care considering the whole set was £2.99! 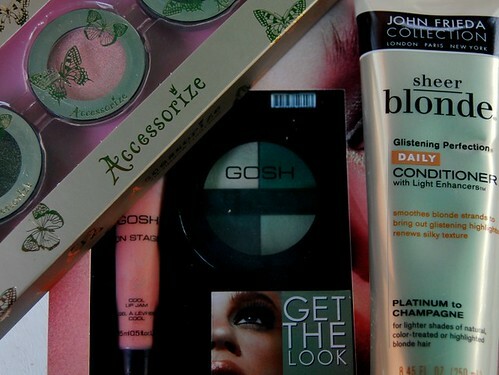 Another thing I treated myself to was the John Frieda conditioner shown. I’ve never tried any of his products before but I’ve heard good things and when I spotted this in a 99p store I couldn’t resist. With all this excitement I really suppose I got rather carried away as I returned yesterday to Superdrug for a little more. I snapped up a set of the polishes for my friend Sarah and grabbed myself one final bargain... A palette including 12 eyshadow shades, a gorgeous shimmery lipgloss tube a set of false eyelashes. Everything in the above photograph cost the grand sum of £2.49 and came in some lovely packaging! 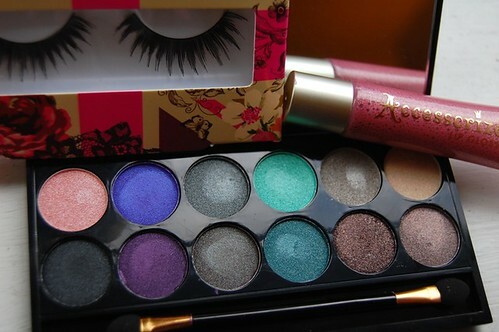 The palette resembles some of the Sleek ones available and the shades all seem incredibly wearable. Swatches and reviews will naturally follow but for now I’m going to bask in the glory of a few good bargains. Check out if your local Supderdrug are stocking any of these because they really are at pocket-money prices! The palette is lovely and great value for how many options it gives! The GOSH thing was just by sheer luck, I bought it in a very small branch so I'm not sure how many there'll be left elsewhere.